My son gave me the coolest gift for my birthday - a Charlie Brown Christmas Tree. Now some of you might wonder why I think that is so cool. I mean, it's a lonely, bare tree that represents the ultimate failure of a blockhead child. Charlie was laughed out of the auditorium when he presented it to the Peanuts Gang. Yet, there are lessons in that tree that all independent retailers can learn. Linus wrapped his blanket around it to give it support. What have you wrapped around the foundation of your business to give it support? Have you secured your financing? Have you bolstered your training program to make sure your staff is fully trained and ready to deliver excellent customer service? Have you checked to make sure your inventory includes an ample supply of the "must have" items - the stuff you can never be out-of-stock? These are the foundations that give your business support, no matter how simple or bare your business might be. Back to the tree... After Charlie Brown left, the other kids gathered around and decorated the tree with stuff from Snoopy's dog house. The finished product looked as good as any tree ever did. But it wasn't the decorations that made the tree special, it was the love they poured into it. You don't need the budget of Nordstrom's to dress up your store to look its best. You only need to add in some Love. Pour some love into your business. Show your customers how much you love what you do, and you'll look more special than any overspent, over designed, cold, heartless big box store. Show passion in your design, passion in your policies that serve, and passion in your interactions with the customers and you'll be the best tree on the block. 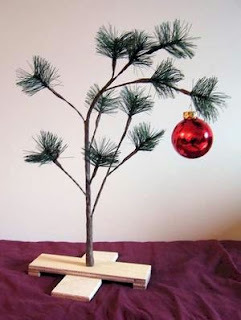 Even a simple tree like Charlie Brown's can become something special. So, too, can your business.